205acbc0.any.gs is a shortened URL of some website, and, if you have been provided with some pop-ups associated with 205acbc0.any.gs, the odds are that your Internet browsers are afflicted by an adware program. The shortened link is produced by LinkBucks, which is and advertising networking enabling web users, websites and online marketers to earn revenues from clicks. Each time someone clicks on a link shortened by LinkBucks, the person or company that has shared the link earns some money. Moreover, unlike other advertising networki, LinkBucks is said to send its clients money on demand. Even though the service can be used safely by anyone, the shortened links such as 205acbc0.any.gs may cause a lot of trouble. They may be used to deceive computer users into visiting unreliable websites. For example, a shortened link can be use used on Twitter, Facebook, and other social networking websites. Without seeing the actual URL you cannot tell to what website you will be taken, so, if you want to protect your privacy, you should ignore shortened links that are provided to you by unknown or questionable accounts. If you find pop-up advertisements containing the link 205acbc0.any.gs, it is very likely that you will not be able to access the website advertised because the link has been removed from the database of linkbucks.com. Adware programs are usually supported by several advertising servers, which means that in addition to 205acbc0.any.gs pop-ups you may find other advertisements. 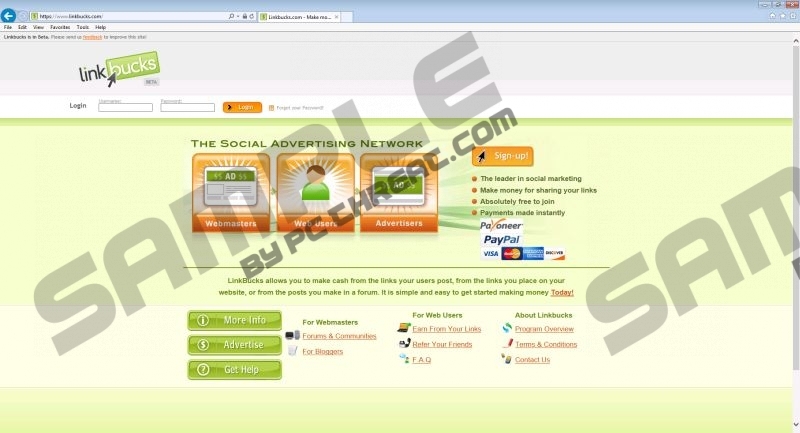 LinkBucks can be used by any website or software developers, so it is impossible to name all the clients of this advertising network. Nevertheless, you should keep in mind that adware developers are not associated with the websites advertised, which implies that you interact with web banners, pop-ups, and other advertisements at your own risk. Moreover, it is important to note that you may be monitored by the adware program. The creators of the adware may be interested in your search terms, clicks, browsing history, and other information related to your online actions. When it comes to the removal of the adware displaying 205acbc0.any.gs pop-ups, you have two options. Below you will find our removal guide, which will help you uninstall any unwanted program. You can also use a spyware removal tool, which enables you to find out what the actual security status of your computer is. We recommend that you use SpyHunter because this security tool can fight of browser hijackers, rogue anti-virus programs, Trojan horses, and many other computer threats. After removing the unwanted program, do not forget to install a reliable scanner so that you can find out whether the computer is afflicted by some other unreliable programs or not. Quick & tested solution for 205acbc0.any.gs removal.